" What we do in life ripples through eternity." To call on the architypes behind the form of trees and plants. To help pull a group together, to help harmony in a work place. The beats used in sacred drumming are simple. Based on the Heart beat, at different speeds 1, 2, 3 0r 4 beats per second help to create energies for our body and brain to become syncronised for healing or journeying and much more. Much work has been done in the field of research to link drumming with positive affects on our body and brain. Click here for more on drumming and the Brain. Spreading the news of ancient ways. Helping to spread the news of ancient ways, made relevant in a modern setting, is a great honour for me. Having found the techniques, we learn on the Sacred Drumming Course, to be so beneficial to my own healing practice and to help clear, energetically, our Home and healing spaces. I started to realise that if we can find the discipline to use what we learn, on this course, as a daily practice. Then our days seam to flow much more with synchronicities and beneficial interactions. Whether shopping at the supermarket or attending a yoga class, there is always an energetic interphase with the people and our surroundings. Our extensive course not only deals with protection, journeying, drum and rattle healing, we also discover how to stay alert to our energetic interactions in our daily lives. The simple use of drum and rattle to clear and smooth out the energy surrounding our physical body has become an integral part of my daily life. And has helped the clients who come to our healing practice. This help ranges through helping with stuck energy, whether in the aura or the body. Also depression, addiction have all shown a marked improvement after just one or a few treatments. When we feel centred, and safe, decision making becomes easier and out comes seam to be reached with less effort and anguish. Also being able to interact with nature on a deeper level has meant, for me, that I now realise that the power under our feet, is waiting for us to interact, and this can be felt when journeying into our environment to contact nature directly. Grounding is a key element for me in clearing the energy body and the physical body. Contacting the earth with bare feet and an open heart and mind is inviting ions to be absorbed into our bodies , where they can play a part in energising our endocrine system. So ask your self are you ready to embark on a personal journey of change and life affirming practices. 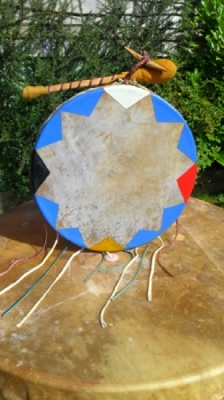 If you have the intention of bringing the drum and rattle into your healing practice , or for personal growth , then this course will provide you with the safe steps for creating sacred space and clearing energies whilst opening up a whole new way of mapping energies within the sacred directions, space with which you are individually connected and become more connected to as we learn to journey into the lower , middle , and upper worlds. Mike holds Drum and Rattle making days for groups and individuals.If you would like to attend a workshop please contact Mike and he will let you know more details of the next event to be held.